Apple(s aapl) filed a patent on Thursday that could yet bring NFC, or near field communications, to its iPhone. The patent describes a point-of-sale transaction that uses NFC to establish a secure link with a purchasing device. That device then uses a different wireless interface to complete the transaction. 9to5Mac spotted the patent filing and suggests that Apple is simply keeping its options open for wireless payments but will instead use iBeacon technology. I don’t think that’s a likely scenario. While iBeacon is meant for nearby location use-cases, the definition of “nearby” is more like a 100 feet radius. That’s useful for targeting ads more than it is for payment transactions. 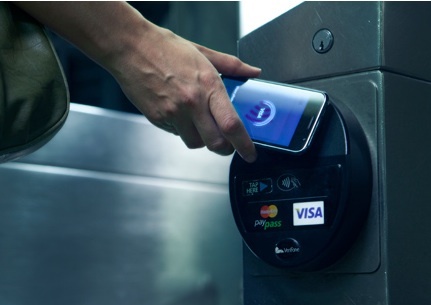 Unlike other smartphone makers, Apple has yet to include an NFC chip in its mobile devices. Android(s goog) device makers have included it in some models both for mobile wallets — see my first NFC transaction in 2011 here — as well as for simple device pairing. Even if Apple is granted this patent, it doesn’t mean that the next or a future iPhone will necessarily include NFC technology. Apple is always trying new ideas and patenting those that it wants to protect. A related question might be whether Apple will include NFC in the iWatch. The FitBit has it but it’s not widely publicized. Maybe Bluetooth is not as low energy as everyone would like. I still think the AFC will win the Super Bowl though.